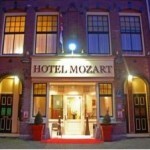 Hotel Mozart is a three star hotel, somewhere in the middle between the Museum Quartier and the Dam Square. 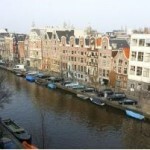 It is quite modern, the prices are not too high, and some of the rooms have view towards the canal going next to the hotel. 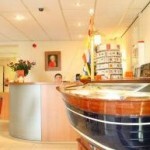 The hotel offers free wireless internet. Not the best location, but easy to get around on foot from here. Quite a lot of canal cruises pass by on the canal passing outside the hotel.